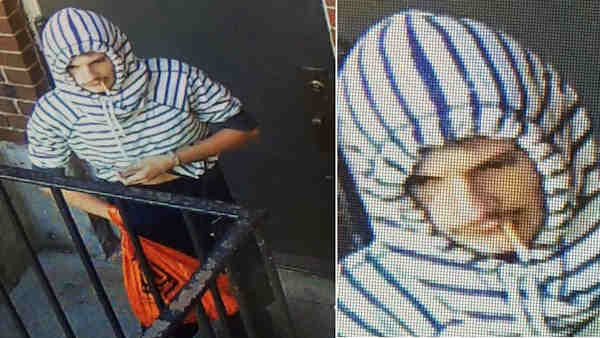 BROOKLYN, New York (WABC) -- Police are looking for a suspect after a boy's cell phone was stolen while he was on the way to school. Around 7:30 a.m. Sept. 2, a man suspect approached a 12-year-old boy as he walked to school and asked to use his cell phone. According to the New York City Police Department, the victim gave the suspect his phone, but when he tried to get it back, the suspect pulled out a knife. Police said the suspect threatened to stab the boy if he followed him. The suspect fled west on Shore Parkway. The individual is described as white, 25 to 30 years old, 5 feet 8 inches, 160 pounds, with a mustache. He was last seen wearing a blue and white striped hooded sweater, dark shorts over dark colored pants and white sneakers.